Have you ever seen texts like these next to the From Email of your Campaigns: “on behalf of dptagent.net” or “through dptagent.net”? If so, it is important that you know that their appearance is due to authentications used by Email clients such as Gmail, Outlook, Yahoo and AOL to verify that an Email comes from a legitimate Sender. In this article, you’ll learn how this type of authentication works and how to remove this information from your Campaigns. The reason why authentication information appears? The email address that appears in the From field. The address of the sender, that is, the Doppler servers used to send the Campaigns. For example, dptagent.net, dplrtp.com and dptagent.biz. Some Email clients display both the information that you defines in your shipment and the data of our servers in the From field. That is because your Email domain is not authenticated. Let’s look at some examples. 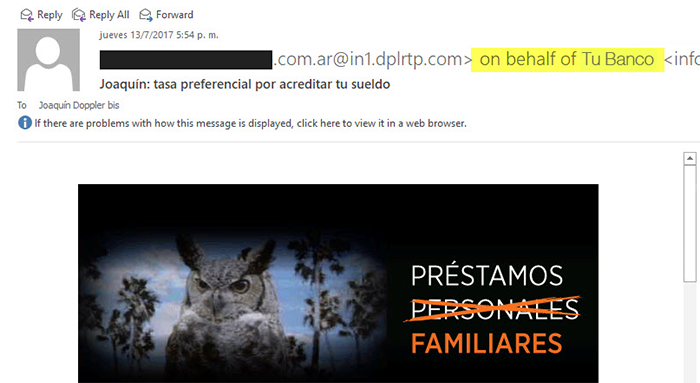 If you send a Campaign from Doppler using the From Email info@educacion.com, it will be authenticated with our domain. Email clients will display the Doppler domain near your Campaign From information to help Subscribers determine if it’s safe to open. As you can see in the image below. The best way to do this is to use a From-Email associated with your own domain and authenticate it. To do this you will need to activate the DKIM of your account and register the SPF. These methods make Email clients understand that Campaigns come from your servers, eliminating Doppler information. Avoid unnecessary information in your shipments and increase their effectiveness with these tips. How to validate your From-Email domain?